i looked at the art and i read the text accompanying it. 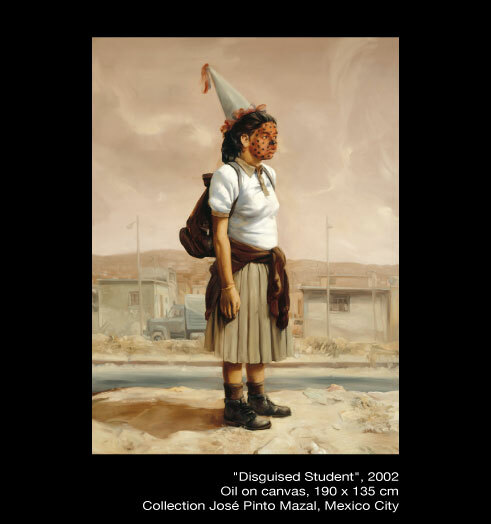 what we have is a neo-mexican version of the same type of male-dominated depictions of women (especially poor or working class women) that have been the basis of art in the western world forever and ever. what made me laugh was his reference to courbet! it was as if he, a mexican male, were competing with courbet for ownership of “the origins of the world”. and the “authentic” origins at that. can he do that? is it his position to do that? what would make me happy is not the utilization of women’s bodies as symbol and allegory by male artists, but for latina artists to make art about their own, REAL, lived experiences. i am more than just my reproductive organs and their purpose, believe me. and i am more than the fantasy or fear that my ‘feminity’ may inspire in a male artist (anglo or latino). i am sure that his argument is that he is using these people as wonderful and exquisite symbols, and perhaps some women may be flattered to be used as “models,” and “muses” (and some women are). but i’d rather be a real, live breathing female artist who makes things. and my experience as a woman of color just does not resonate with his depiction of “our women”–real or mythical.